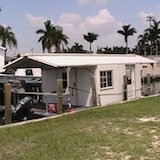 The goal of this page is to compare class B motorhomes. From the original VW bus camper all the way to the fully featured class B RVs of today. VW Campers... These are small, very easy to drive and park, and are great on gas. It's really a perfect vehicle for camping on weekends as well as using everyday. Sportsmobile RVs... These are a step up in size from a VW bus but are still easy to drive and park. They are usually full sized Ford E-series vans that are converted with a pop up roof (similar to some VWs) and they have plenty of features. The great thing is that when not in camping mode you don't have to worry about the height clearance (hitting branches and trees). These are also usually better on gas. Make Your Own... Lots of people these days are finding that it's cheaper to buy a van and convert it into a camper yourself. You can add all the features that you can think of and on top of it all you can make it stealthy so you can have more options for over night parking than with an RV that sticks out like a sore thumb! 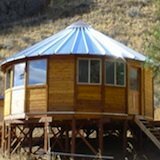 This is the perfect solution for inexpensive traveling. By the way, if you find that you have any interest in converting a cargo van into a camper you might want to take a peak at my teardrop trailer section. 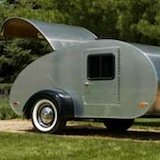 A simple teardrop trailer can be built easily and for just two to three thousand dollars and it can be pulled with your current vehicle. Okay next are class B RVs with the fiberglass tops, also sometimes referred to as conversion vans or camper vans. Used Class B RV... There are a bunch of these out there. From the Intervec Falcon to the Airstream Class B. 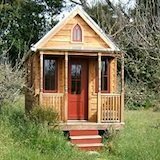 They are usually fully featured with shower, bathroom, kitchen, and can sleep up to four. They also usually have a generator and air conditioning. Newer Class Bs are usually from Roadtrek (190 and 170) which feature lower height clearance because they lower the floors inside instead of raising the roof only. This makes them costlier to make but better with gas and less worrisome when driving. Sprinter RVs... There are lots of class Bs now that are based on the Dodge / Mercedes Sprinter which is great on gas mileage (around 19 mpg). These are beautiful, quite spacious, but very expensive. Check out these awesome 4x4 / offroad ready class B's.